Wild horses at the Salt Wells Creek Herd Management Area. Wild horses are shown at the Salt Wells Creek Herd Management Area in Wyoming. The Bureau of Land Management captured and removed 1,968 wild horses from Salt Wells and two other Wyoming herd management areas during a helicopter roundup that ended on Tuesday. Bureau of Land Management officials said on Wednesday that they would not immediately provide a direct response to the National Wild Horse and Burro Advisory Board’s recommendation to kill captive animals. Typically, the BLM responds to recommendations or provides a progress report at the board’s next meeting. At today’s advisory board meeting on Wednesday in Grand Junction, Colo., however, BLM officials said that as part of preparing a new long-term plan requested by Congress, due next month, they instead wanted to receive more input from the board over the course of the three-day meeting. In September 2016, the board voted 8-1 to recommend that BLM euthanize – shoot – so-called “unadoptable” wild horses and burros in government holding facilities. At the time, BLM responded to the public outcry that followed by saying that it had no plans to change its policy — and that it would respond to the recommendation at the next advisory board meeting. The independent advisory board makes recommendations to BLM; it does not control policy. Since the board’s jarring vote last year, the political climate around wild horse issues has turned darker and inhumane proposals have gained momentum. Released in May, President Trump’s 2018 budget proposal would allow BLM to kill wild horses while also removing all sales restrictions from captive wild horses and burros, likely increasing the number of wild horses that vanish into the foreign slaughter pipeline. 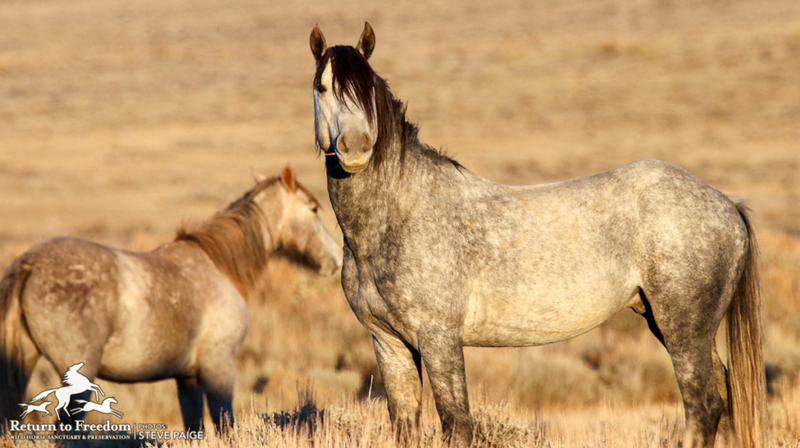 Then, in July, the House Appropriations Committee backed an amendment by Rep. Chris Stewart of Utah stripping protective language for wild horses from its Interior Appropriations bill. The bill did not include the removal of sales restrictions. The Senate Appropriations Committee will soon take up its Interior bill, including BLM’s Wild Horse and Burro Program. If BLM chose not to address the advisory board’s recommendation directly on Wednesday, officials appeared to be building a case for dramatic action — blaming the growing number of wild horses for negatively affecting everything from vanishing perennial grasses to other wildlife to the safety of motorists. Dean Bolstad, division chief of the BLM’s Wild Horse and Burro Program, pushed back against common criticisms of the program, like the number of cattle grazing on wild horse herd management areas and lack of fertility control use. Authorized livestock use on BLM lands in 2016 stood at 12 million Animal Unit Months – the equivalent of 1 million cow / calf pairs, yet Bolstad said that licensed and billed livestock use on designated wild horse herd management areas was 582,000 AUM (1 AUM = 1 horse, 1 cow/calf pair, 5 sheep) compared to 793,000 AUM for wild horses. Livestock grazing is authorized on 155 million acres of BLM land; wild horses are restricted to 26.9 million acres. To this, Return to Freedom says, the judicious use of fertility control is not nearly as tall of an order as removing wild horses and burros and all that goes with it. BLM has never spent as much as 4% of its Wild Horse and Burro Program budget on fertility control, while spending 67% of its $80.555 million budget on capturing, removing and warehousing wild horses in 2016. During the 2017 fiscal year, BLM captured and removed about 4,200 wild horses while vaccinating just 234. In a budget presentation, BLM cited per-horse costs of $1,000 for removal, $1,891 for adoptions and $2,500 for fertility control. Budget analyst Michael Reiland said that the fertility control figure included capturing one mare and one stallion. Questioned about that high cost by the board, Reiland said that the cost of volunteers darting mares on the range would likely be closer to $500. Bolstad did say that BLM would continue to support research into longer-lasting fertility control treatments. “Once AML is achieved, BLM needs to aggressively buy fertility control so that we don’t need to remove so many animals in the future,” he said. Sadly, BLM has been close to its Appropriate Management Level before, but it balked at using fertility control. In 2007, the number of wild horses was within 1,071 animals of BLM’s own population goal (currently 26,715 wild horses and burros); yet, the agency chose not to aggressively implement fertility control — spending less than 1% of its budget on a safe, proven and humane alternative. Now, BLM estimates there are 72,674 wild horses and burros living on the range, as of March, with another 44,640 relegated to government holding facilities, as of mid-summer. The advisory board meeting is set to reconvene on Friday from 8 a.m. to 5 p.m. To watch a livestream of the meeting, go to https://www.blm.gov/live.